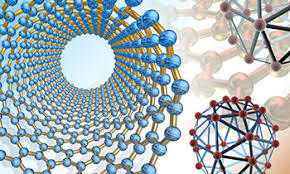 "Fabrication of 2- and 3-Dimensional Nanostructures" by Hong Jiang, Camelia N. Borca et al. Published in the International Journal of Modern Physics B, vol. 15, nos. 24 & 25 (2001): 3207-3213. Copyright 2001, World Scientific Publishing Company. Used by permission. Amongst tools for fabricating periodic and aperiodic nanostructures and nanodevices, electron beam-induced organometallic chemical vapor deposition (E-OMCVD) offers a highly flexible and controllable one-step deposition process. E-OMCVD enables maskless fabrication of nanoscale research and custom structures that have least dimensions near or below 10 nm–a scale at which other methods prove difficult or costly. Using the focused electron beam in a modified HB501 field-emission scanning transmission electron microscope (STEM), pads and wires with uniform thickness and well-defined shapes have been defined and deposited. Although conditions for fabricating the smallest deposits have not yet been optimized, the edge acuity (sharpness) of the deposits is consistently as low as 4 nm or less and the corresponding smallest wire width is 8 nm. Under different deposition conditions, three-dimensional open structured nanonetworks have been fabricated. Results of an investigation of E-OMCVD parameters are presented for the metallocene compound, nickelocene (Ni(Csub-5Hsub-5)sub-2), as source organometallic.